surfaces, including vinyl, metal, clay, leather, and natural and synthetic fabric and paper. giving the user more time to work with individual colors. they’re washable and dry-cleanable on fabrics after heat-setting or air-curing for at least 72 hours. Permaset Aqua Fabric Ink is an environmentally friendly, easy-to-use ink that provides long-term durability without compromising its soft handle. The colors are 100% solvent-free and water-based, offering superior performance, durability, and softness. The pigments are rich in coverage, intensity, and produce exceptional color yield. The inks are low odor, and can easily be cleaned up with water. 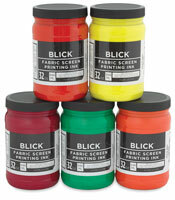 Supercover and metallic colors are opaque, and they can be used on light or dark fabrics. After heat fixing, the resilient resin base holds strong during rubbing, washing, or dry cleaning on cotton, polyester, silk, and most synthetic fabrics. 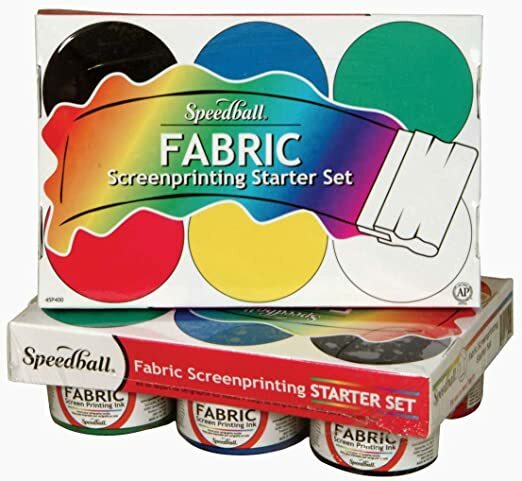 Speedball Waterbased Fabric Screen Printing Inks are great for use onlight-colored cotton, linen, blends, polyester, rayon, and other synthetic fibers (except nylon). Use the process colors for 4-color process printing. 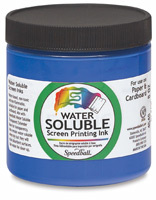 The inks can also be brush-applied to tennis shoes, canvas bags, and more. Preferably students shouldn’t buy other brands other than those mentioned here. Students may choose colors from any brand, as long as they are the same or mix brands. Paints’ names are slightly different for each brand. DO NOT buy Daler Rowney brand. *When you see “hue” written on a paint tube (ex: Cadmium Red hue) it means imitation, not a pure pigment but a combination of cheaper available reds to make a color very close. So you can imagine it’s never going to have the color saturation that an artist grade paint will have. illustration ... you name it! They're great for all surfaces, including wood, fabric, ceramics, canvas, or any porous surface. Liquitex Heavy Body Artist Acrylic Colors are professional-quality acrylics that have an exceptionally smooth, thick, buttery consistency, ideal for traditional art techniques that employ brushes and painting knives, as well as experimental, mixed-media, collage, and printmaking applications.